As the monks of Saint John’s Abbey might themselves say: Hallelujah! The popularity of Illuminating the Word: The Saint John’s Bible, combined with the delighted approval of the exhibition’s design from the monks of Saint John’s University, has led to an extension of the show’s run. Previously set to close on April 7, The Saint John’s Bible will now be on exhibit in the History Museum’s Herzstein Gallery until December 30, 2012. “The installation of the folios in the New Mexico History Museum presents The Saint John’s Bible in one of the most beautiful and faith-filled exhibitions of this Bible done to date,” said Tim Ternes, director of The Saint John’s Bible. “The contemplative environment artfully shares the story, work and process of this monumental project in a setting that compels the guest to slow down, relax and reflect. Commissioned by the monks of Saint John’s Abbey and University in Collegeville, Minn., The Saint John’s Bible represents a remarkable achievement in the book arts. In 2000, Donald Jackson, senior scribe to Queen Elizabeth, and a crew of artists and calligraphers began the first of the Bible’s 1,150 vellum pages—from Genesis to Revelation. Last May, the project achieved completion when Jackson wrote the word “Amen” on the final page of the Book of Revelation. All of the pages will eventually be bound into seven volumes for use and exhibition at Saint John’s Abbey, but in the meantime, 44 pages from two of its Old Testament volumes–Prophets and Wisdom Books–are on exhibit at the New Mexico History Museum. More than 26,600 people have come to the museum to see the Bible and take part in the activities and lectures that accompany it. Tom Leech directs the Palace Press, a working exhibit that celebrates the book arts. He helped bring this contemporary masterpiece to Santa Fe to help visitors experience how profoundly beautiful and moving an illuminated manuscript can be. Saturday, February 25, 10 am-4 pm, NMHM Classroom: “Oh My Gouache,” calligraphy workshop by Diane von Arx, special treatment artist for The Saint John’s Bible. This event is sold out. 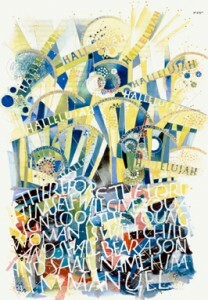 Sunday, February 26, 2 pm: “Special Treatment Illuminations for The Saint John’s Bible,” lecture by Diane von Arx. Sunday, March 11, 2 pm: Schola Cantorum of Santa Fe and the monks of Christ in the Desert Monastery perform in the History Museum Lobby. Sunday, March 25, 2 pm: “Endangered Texts: Preserving Ancient Books the Benedictine Way in the 21st Century,” lecture by Father Columba Stewart, executive director of the Hill Museum and Manuscript Library at St. John’s University in Minnesota. 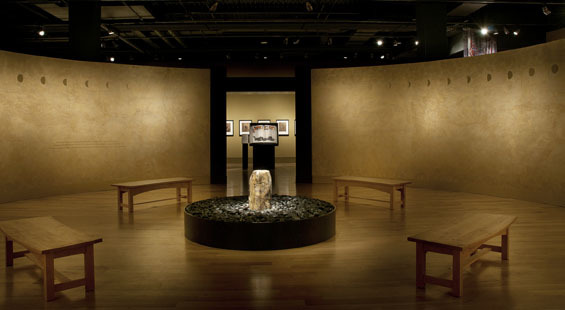 Sunday, April 29, 2 pm: Contemplative Landscape photographers panel discussion; Kirk Gittings, Ed Ranney, Janet Russek, Sharon Stewart and Don Usner. Friday, June 1, 6 pm: “Fragile Faith,” lecture by Contemplative Landscape photographer David Robin. Friday, June 8, 6 pm: “Landscape and Memory,” lecture by artist and calligrapher Laurie Doctor. Saturday and Sunday, June 9 & 10, 10 am-4 pm, NMHM Classroom: “Landscape and Lettering: Before the Separation of Drawing and Writing,” calligraphy workshop with Laurie Doctor. Cost is $200. Limited seating; call (505) 476-5096 to register. Friday, July 13, 6 pm: “Poetry & Photographs,” discussion and poetry reading with Contemplative Landscape photographer Teresa Neptune and poet Miriam Sagan. Sunday, October 14, 2 pm: “Ritualized Naming of the Landscape through Photography,” lecture by John Carter, photography curator at the Nebraska State Historical Society. Sunday, November 4, 2 pm: Red as a Lotus: Letters to a Dead Trappist, poetry reading by Lisa Gill; and Compassion Rising, a film about Thomas Merton and the Dalai Lama. Sunday, December 2, 2 pm: Sacred choral music by Schola Cantorum of Santa Fe and the monks of Christ in the Desert Monastery. Outlaws, Rough Riders, classic restaurants and a possible spy will come to life at the 2012 New Mexico Statehood History Conference, May 3-5, in Santa Fe. Presented by the Historical Society of New Mexico and the New Mexico History Museum/Palace of the Governors, this Centennial version of the Society’s annual conference includes a special treat: A daylong free symposium, open to the public, plus free admission to the History Museum on May 3. The conference, May 4 and 5 at the Santa Fe Convention and Visitors Center, is held in collaboration with the New Mexico Heritage Preservation Alliance, which is having its annual conference at La Posada that weekend. Details, including special hotel rates and how to register for all or part of the Statehood History Conference, are at the Historical Society’s web site. Society members who register for the conference by April 23 will get a specially discounted rate of $95, which includes the Thursday evening opening reception at the History Museum, lunch on Friday, and the Statehood Centennial Banquet on Friday evening at the Convention Center (a total value of $125). The closing Cinco de Mayo reception at the Governor’s Mansion will feature the annual Historical Society of New Mexico Awards presentations. The conference includes a silent auction as well as a book auction. 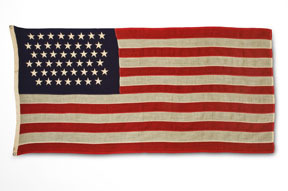 Items will include artwork, jewelry, historical maps, rare books, and statehood memorabilia. If you’d like to donate an item, e-mail Mike Stevenson at mgsalp@newmexico.com. The museum’s Collections Committee had its monthly meeting this morning and, among other businesses, accepted a piece of 1927 ephemera from Gov. 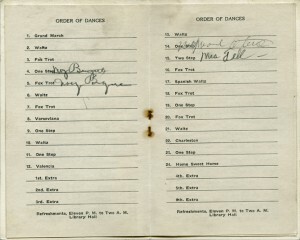 Richard C. Dillon’s Inaugural Ball. It’s a neat little six-page affair, about 3 1/2 x 5 1/2 inches, with an honest-to-goodness sign-yourself-up dance card in the middle. Nancy M. Tucker, an Albuquerque resident, provided the inaugural program to us via her regular wanderings about the offerings on the Internet. We have a number of “angels” like Nancy out there, some of the bona fide pickers, some of them folks who just have an interest in history and particularly New Mexico history. Dillon’s Inaugural Ball was held at the Palace of the Governors and the National Guard Armory, a building that used to be north of the Palace and is now occupied by the New Mexico History Museum. According to the program, some of the luminaries involved in the organization of the event were Gov. Arthur T. Hannett, Arthur Seligman, Miguel A. Otero Jr., Nathan Jaffa, and Archbishop A. T. Daeger. Decorations festooned the Palace and Armory, along with the Capitol (today’s Bataan Building), and the Museum of Fine Art. Norman L. King served as the parade’s grand marshall. To anyone familiar with New Mexico history, the plethora of names listed among the other committeepeople who helped with the inaugural reads like a who’s who of 1920s Santa Fe and New Mexico. Among them: John Meem, Oscar Huber, Mrs. Ashley Pond, Mrs. N.B. Laughlin, Mr. and Mrs. Henry Dendahl, and Mr. and Mrs. John N. Zook. Dillon, a Republican, was the eighth post-statehood governor of New Mexico. According to the National Governors Association, he “was born in St. Louis, Missouri, on June 24, 1877. His early education was attained in the common schools of his native state. He later attended the public schools in Springer, New Mexico, where his family moved in 1889. Before entering politics, Dillon worked as a railroad laborer and a merchant. “In 1924, he won election to the New Mexico State Senate, a position he held two years. 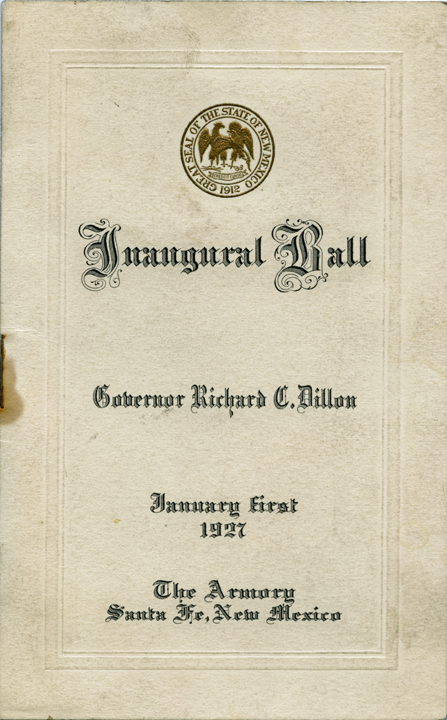 Dillon next secured the Republican gubernatorial nomination, and was elected governor by popular vote on November 2, 1926. He was reelected to a second term in 1928. The Golden Rule is my rule! 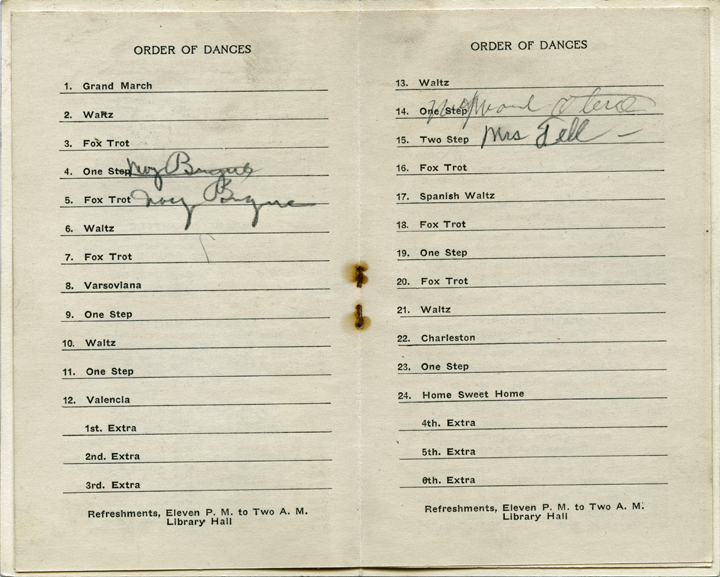 The museum is grateful to the many people who keep us in mind when they come upon items that help us tell the story of who we were and who we are. If you think you might have something of interest, give us a call and let’s have a chat. Imagine a world where Frederick Douglass had not learned to write. Would the Emancipation Proclamation have been issued in 1863 or might it have withered and waited without the stirring speeches Douglass wrote, published and delivered, advocating against the slavery into which he was born? Historians and what-if theorists can argue that for days, but the rest of us can be satisfied in knowing that, thanks to Douglass’ writing skills, we have a stirring, first-person account of what life was like in an America that regarded black people as property. Just in time for Black History Month comes a new broadside from the Palace Press at the New Mexico History Museum. 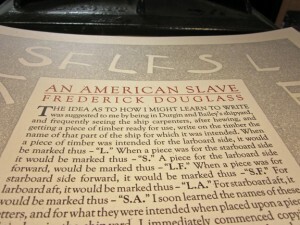 And though we’re mentioning its tie to that month, the excerpt featured from Narrative of the Life of Frederick Douglass serves us in a timeless way, reminding us of how difficult it can be for anyone to learn how to fit words together and how crucial it is to master that learning curve in order to make compelling points. In this case, points that changed the course of history. 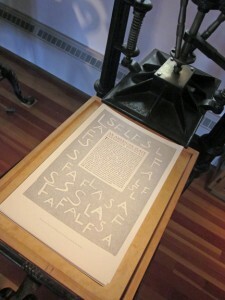 Copies of the 12½” x 19” broadside (printed on heavy, recycled, acid-free paper) can be purchased for $25. Come by the Palace Press, open 10 am to 5 pm, Tuesday through Sunday, or call Leech at 505-476-5096. 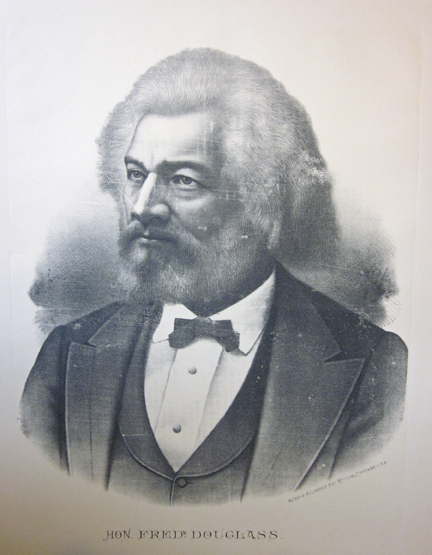 That’s not the only memory of Frederick Douglass available at the Palace Press. 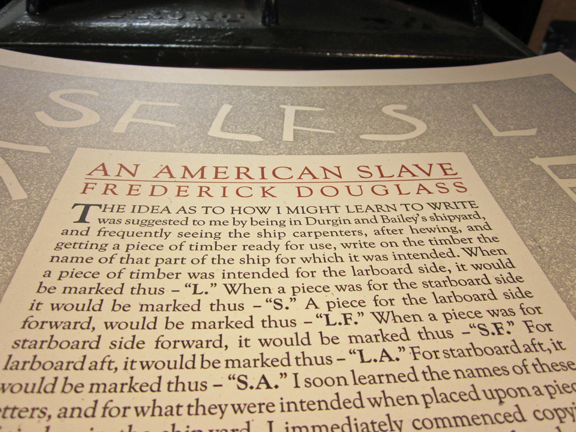 In 2010, the Palace Press exhibited in the museum’s front window a lithographic press (one with an extraordinarily fabled background story), along with a printing stone that held a portrait of Douglass, loaned to us by Landfall Press, Santa Fe’s fine art lithographers. Their printers pulled 10 copies from the stone, and now just a few of those prints are still available and can be purchased for $100. As clubs go, it’s a small one, but its work has made a big difference in the lives of people dealing with Santa Fe’s winter up close. Formed this fall by Department of Cultural Affairs staffers who simply enjoy knitting for themselves and their families, the members of the DCA Knitting Club had two aims: to share a dose of the social graces with one another while knitting, and to direct their efforts to people in need. 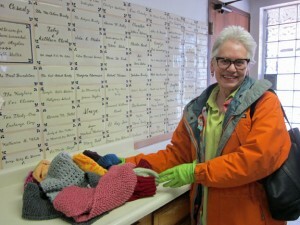 On Feb. 1, as weather reports warned of a coming cold snap, the first result of their bounty was delivered to St. Elizabeth’s Shelter — a pile of beautiful and colorful scarves, caps and mittens. Levine and Hart said the original intent was to gather regularly and knit together, but busy schedules made that impossible. Still, they built friendships through e-mails, phone calls and shared knitting patterns. Among those patterns were ones that Mann’s grandmother had used to knit for soldiers during World War II. 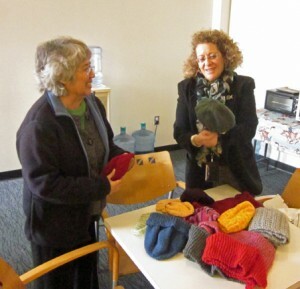 The group hasn’t decided what project to take up next, but does plan to keep knitting for others. If you’re interested in joining, give one of the members a call. Everyone’s welcome, from beginners to experts, men, women and children.